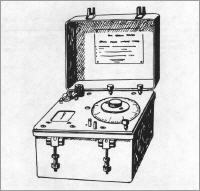 The BM-52 blasting machine is a direct-current generator activated by pushing down on the handle which provides the electric current for igniting the detonator. 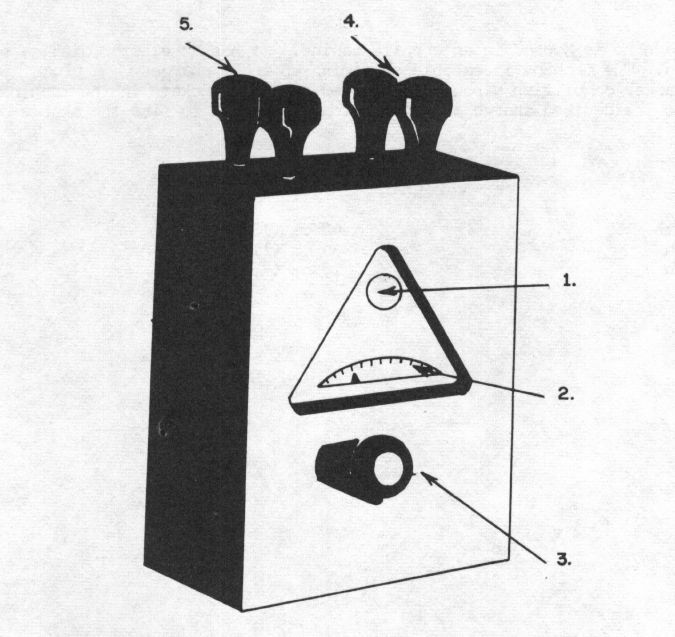 Voltage produced in the generator passes into the circuit of the choke and electric detonator. Current flowing in this circuit is not regulated instantly beacause of the large amount of choke inductance. When the current flow increases to the point at which the detonator bridge burns out, the detonator explodes and sets off the whole charge. The PM-1 and PM-2 blasting machines are both low tension electric generators patterned after older German models. 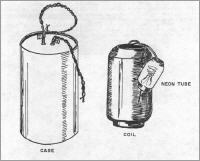 The PM-1 blasting machine can detonate 100 electric caps wired in series to a distance of 2 km using standard firing wire. The PM-2 blasting machine has an aluminium case which houses a steel magnet armature and gear assembly. There is a close resemblance between the PM-2 and the US 10 cap blating machine. Both the PM-1 and PM-2 are operated by turning a crank. Output: (PM-1) ± 290 volts at 1 amp through a maximum of 290 ohms external resistance. Another one in the PM-serie, the PM-4. I have no data for this model yet. 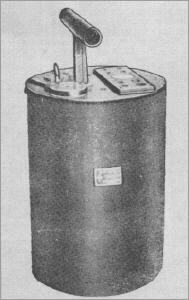 The PM-627 is a cylindrical, hand-operated, low tension electric generator developed after World War II. The machine consists of a metallic case containing a generator unit, a centrifugal switch, and a gear assembly. A crank and extra spring (with case) are secured to the carrying strap. It can set off 50 electric caps through a maximum of 2,000 meters (1.24 miles) of firing wire. To operate the machine, the crank is placed on the release post and turned counter-clockwise. The crank is then placed on the winding post and wound clockwise. To supply current to the terminals, the crank is replaced on the release post and turned clockwise. Length: 414mm , diameter: 140mm. 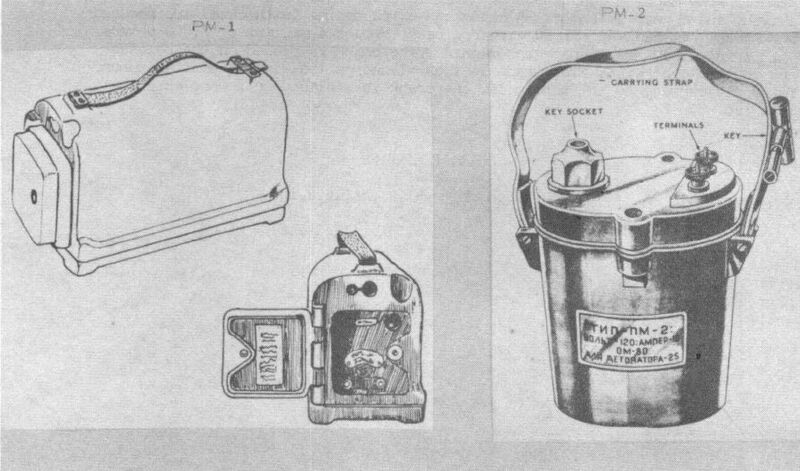 The Soviet radio mine-detonating device, F-10, and its associated equipment is a means of controlling the detonation of mines and explosive charges by frequency induction after abandoning an area to the enemy. 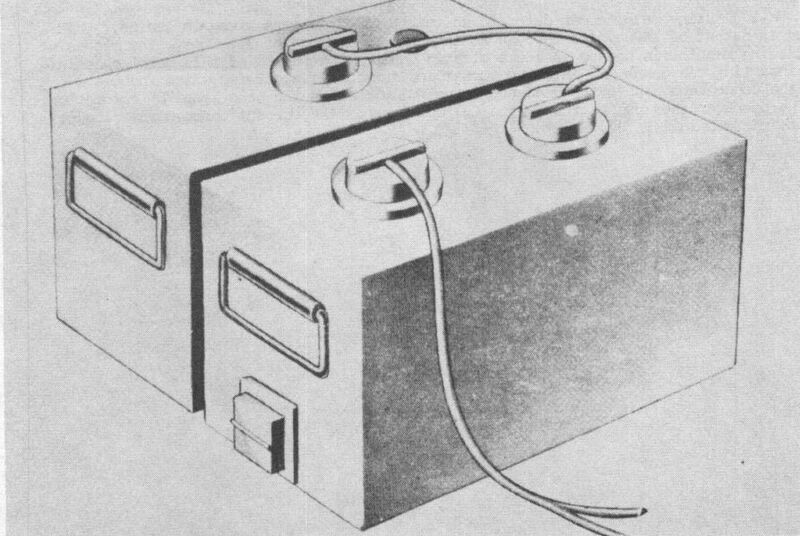 The F-10, with its 30m (100ft) long antenna, is essentially a radio reciever which closes the mine-firing relay upon reception of a pre-determined radio signal sent out by a controlling transmitter. 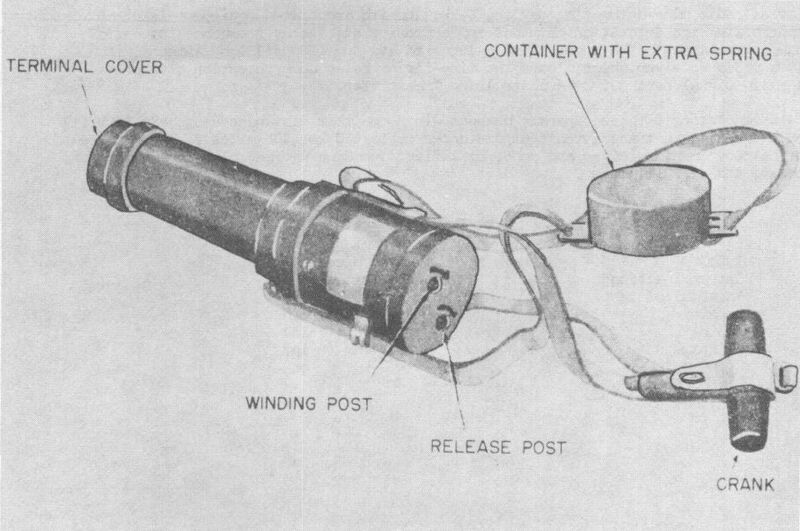 One F-10 can detonate three separate charges wired to it at distances up to 48m (160ft) by means of radio signals transmitted from distances up to 480 km (300 miles). This device consists of battery case, reciever and core, amplifier, decoding device, clockwork mechanism, antenna socket, and circuit closer. Length: 305mm , width: 203mm. 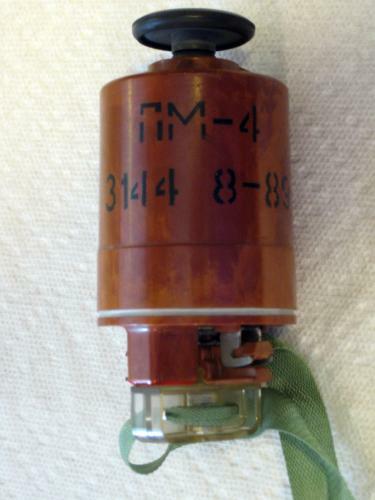 The K-PM-2 blasting machine can detonate up to 350 electric caps wired in series. This machine has an output of 1500 volts through an external resistance of 750 Ohms. 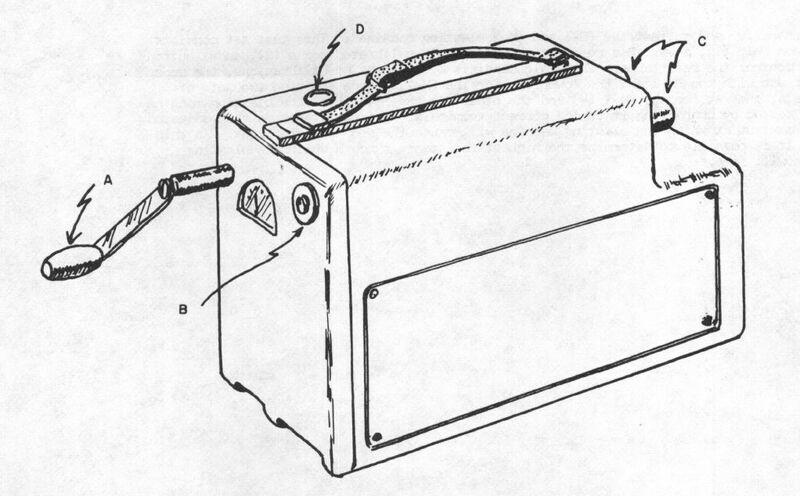 The mechanism for the blasting machine is housed inside a plastic casing. Operation of this machine is initiated by inserting the crank "A" into the socket and turning it clockwise which induces a charge in the condensers. When the condensers are fully charged the neon lamp "D" automatically lights. The operator then pushes the button (B) which sends the current through the circuit connected to the terminals, "C". Generally used to test the PM-1 and PM-2 blasting machines. This test set consists of a neon bulb (1), a variable resistor with a movable calibrated scale (2), and a button (3) to control the resistance. The scale consists of two sets of calibrations, the upper one for use with the PM-1 and the lower one for the PM-2. There are also two sets of terminals, one set for the PM-1 (4) and the other for the PM-2 (5). The blasting machine can be tested by connecting it to the correct terminals. The resistance is then adjusted to the maximum at which the blasting machine will cause the neon bulb to light. In this manner it is possible to determine the highest resistance through which the blasting machine will fire. This blasting machine is housed in an ebonite case. It has a selector dial, a push button and 11 sockets. The machine is capable of firing up to 11 charges. A plug from a charge or a larger demolition circuit is plugged into the sockets in the machine. 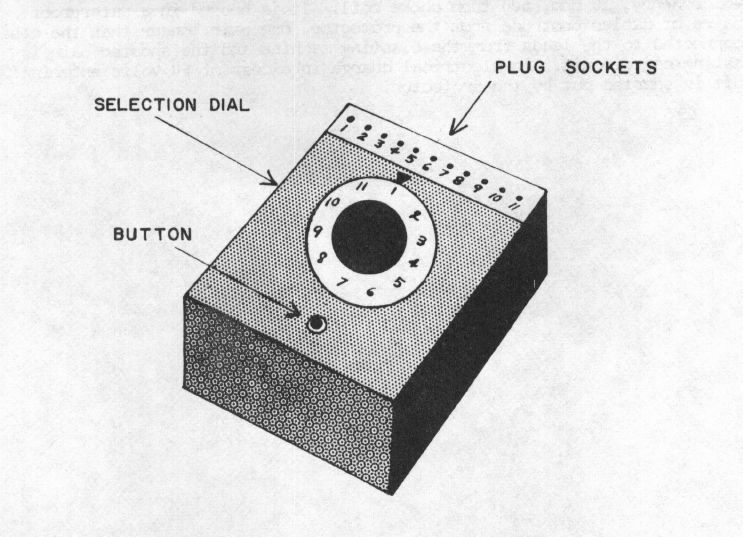 The dial is turned to the desired charge and the button is pressed to fire the charge or circuit. Length: 400mm , width: 300mm , depth: 200mm. 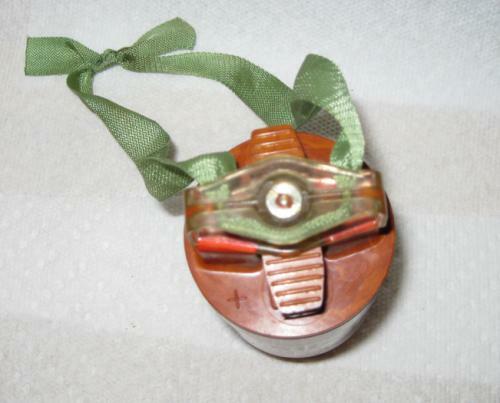 This device is used to protect demolition circuits from premature firing by atmospheric-electrical discharges. The protector consists of a neon tube discharger with a 60-volt ignition potential and a two-microhenry, 10 ohm, 500 turn choke coil. It is housed in a waterproof plastic case. Two pairs of cables protrude from the protector, one pair longer than the other. 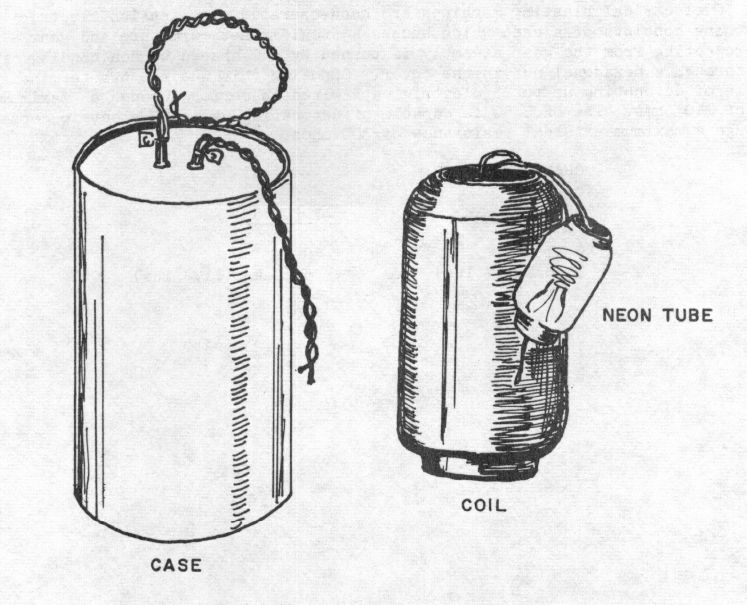 The longer pair is connected to the leads from the blasting machine and the shorter pair is connected to the blasting cap circuit. An electrical charge in excess of 60 volts entering the demolition circuit is shorted out by the protector. The LMV 47 performs both resistance and continuity tests in demolition circuits. 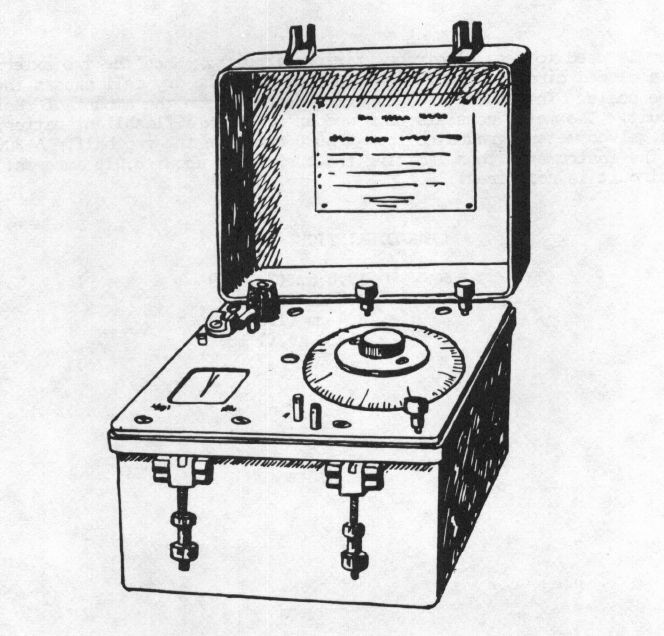 The instrument consists of a watertight metal case which contains a 1.45 volt battery, a glavanometer, and a variable resistor. 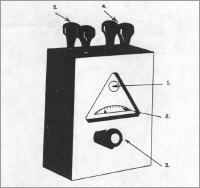 There are three terminals which give two resistance ranges - 0.2 to 50 ohms and 20 to 5,000 ohms. Maximum current produced by the battery is 0.10 ohms. The LMV 47 operates on the wheatstone bridge principle. Length: 165mm , width: 165mm , height: 200mm. 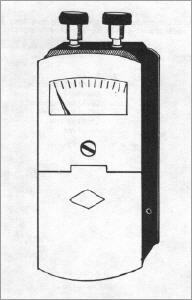 The pocket ohm meter is used to test electrical firing circuits. When the two external terminals are joined to a closed circuit, the flow of current from the dry cell causes the needle to move across the scale. The amount of deflection depends upon the amount of resistance in the closed circuit. 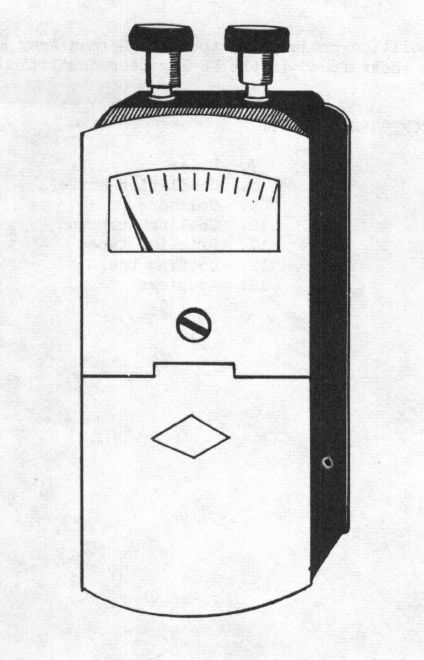 The meter consists of a wooden box with a flashlight bettery in the bottom half and a galvanometer, graduated from 0-5000 ohms, in the top half. A 300 ohm resistor is part of the instrument, thus limiting the current to about 0.013 amperes, which ensures that the circuit is not fired. Height: 180mm , width: 74mm , depth: 340mm.